The most irritating thing for Internet users are spams; nobody wants spams. Spam is described as any unwanted mail or message from a company or someone advertising their products or cheating for money. The most popular spam forms are email or text message, but now also include iMessage especially for iPhone users. Spam is so irritating because it wastes a lot of time, uses a lot of storage space, eats up a lot of network bandwidth, and it can fraudulently obtain the personal information or details of online accounts, and moreover it can lead to virus disrupting your system. As the Internet is public, it’s very hard to control the in and out of spams but, a filter can be used to block unwanted spam messages on your iPhone. In order to protect the private data from spamming we have provided several ways to help you out in this article. Tips: If you accidentally deleted important messages from iPhone, you can always use Jihosoft iPhone Data Recovery to get those texts back even without backup. iPhone doesn’t provide an option to block junk mails in individual mail apps like Gmail, Yahoo mail, Hotmail, etc. So you need to login in the desktop version of your individual mail apps one by one. After login, open the spam message you received and, then click on the contact who sent it and select ‘block this person’. Afterwards this person can never send you spam mail again in future. Another way to avoid junk mails is to using iCloud service. This can be done by marking the spam and then flag the mail in iCloud mail. Moreover, there are several mailing rules working to block such emails from that sender. You can also make use of the mail app on Mac or iCloud.com to block spams from your mail account. Another way to help you in blocking spam messages on iPhone is to use the filter feature available on iOS 8 and above. 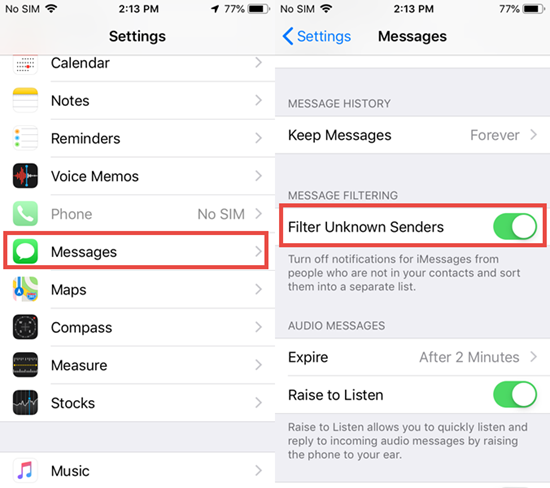 This feature will help you filter any unknown sender. However, it is important to mark spam messages manually to prevent messages from the same sender or unknown senders. To do this, here are the few basic steps you need to follow. Go to the ‘Setting’ option in your iPhone. Click on the ‘Messages’ to open the message menu. In the menu slide, turn on the ‘filter unknown senders’. After doing this, no unknown spam message will reach your primary mailing lists. Detecting spam, filtering the emails and hence helping the user to block the junk emails or delete them. Preventing new spam emails from coming to you. Learning from user’s behaviour to improve the filtering process. Giving reports of spam messages information to the user. Here, we bring you a new and advanced filtering applications which work well with iPhone to blcok junk mails and spam texts. With Spamdrain, only messages with real e-mail qualities get through. The spamster is used to filter the unwanted emails or data. It separates out spam data and avoids the attacks of viruses as well. It enables a protective shield for mailing box so as to avoid future entries of such spams. It notifies you about the mails or other stuff it has blocked. You can easily allow the incoming of wanted emails into your primary list by splitting out that mails. You don’t need to pay a single penny for the usage or upgradation of diameter. It carries out its functionality and works on its own. It works hassle-free after knowing the user more and filters spam out more properly. This application is mainly used by iPhone users to preserve their privacy along with spam filtration. It does not access the phone’s data or send them to the app’s server. It works manually on the user’s device providing privacy to the user. You can opt for keywords to avoid the messages manually. It also enables users with its whitelist features to add keywords whenever wanting. This application is completely technological advanced and based on new Machine Learning tools. It doesn’t have whitelist feature but can be controlled manually. It is featured with frequent traveler mode. Hiya is widely used as a call blocking application and message filter on iPhone. Hiya’s server determines the spam SMS and removes it. However, it violates the proper privacy service, unlike VeroSMS, so It works well only in few countries like US and UK. We guess You know the importance of spam filtration. 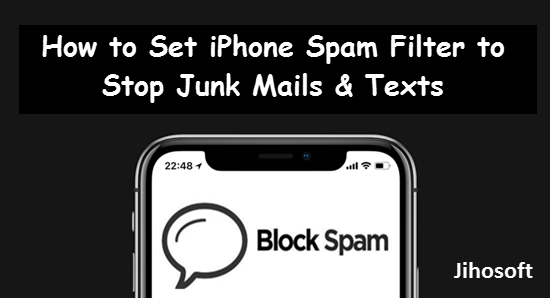 Here, you may get the proper idea about how to block spam mails and messages on your iPhone without any external tool and also you get some spam filtering apps which are very useful and effective though the service provided by these apps are not completely free of cost. You can choose any of these services as per your need and convenience. If you have any question or suggestion, feel free to contact us by comment.